Tulips and daffodils are beginning to grow, a signal that spring has sprung! Many people are starting to peruse the local greenhouses and nurseries, looking for new annuals, perennials, shrubs, and trees to plant. By April, most homeowners in our service area have turned their sprinkler systems back on. If your sprinkler system has been turned off during the winter months and has not yet been turned back on, please, please, please turn on your sprinkler system prior to planting your new vegetation. If there are broken spray heads, leaking pipes or damaged drip irrigation, it is a good idea to have your system repaired before the plants go in the ground. 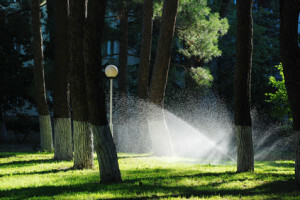 Another thing to think about when turning your sprinkler system back on is water pressure. Water pressure can make or break a sprinkler system. The system itself is designed for a specific range of water pressure. Different types of spray heads require different amounts of water pressure, and the piping moves away from the zone’s valve, the water pressure will decrease. If your sprinkler system is operating at optimum pressure, then the water being emitted from the spray heads will be in a droplet form, resembling rain. The droplets will have enough weight to fall to the ground, to penetrate the soil and to reach the outer edges of the spray head’s radius before being evaporated by the sun and/or light wind. Low Water Pressure – If you have a zone where the spray heads are not popping up completely, this could indicate one of two things. Most likely there is a leak and the leak is robbing the pressure to adequately run the zone properly. This could also signify that this zone is not configured properly and that there are too many heads for the amount of water pressure. High Water Pressure – If there is excessive misting or fogging at the spray heads, then the water pressure is too high. With the much smaller water droplets, a lot of the water will be evaporated or blown away before being absorbed into the soil. When this happens, it will appear that there are “coverage issues” with the sprinkler system, when in fact the pressure is too high. Also, high water pressure puts a lot of stress and wear-and-tear on sprinkler system components, causing the need for more repairs. At this time of year, watering restrictions are changing differently for different cities. Typically starting April 1st, most cities will prohibit watering between the hours of approximately 9:00am to 7:00pm; however, some wait until May 1st. Cities that obtain their water from the North Texas Municipal Water District (NTMWD) will be in Stage 3 winter watering (watering once every two weeks) through the end of April. Many cities outside the NTMWD service area are either currently not under any restrictions or are required to limit watering to once or twice a week. Please check out your city’s website to determine your current watering restrictions, or give us a call. We’d be more than happy to help you out!